27/11/2017 – Improving the effectiveness and timeliness of dispute resolution mechanisms is the aim of Action 14 of the BEPS Action Plan (read the final report on Action 14 of the BEPS Action Plan) and is also part of the continuous efforts to enhance tax certainty. One of the elements of the Action 14 minimum standard requires jurisdictions to seek to resolve mutual agreement procedure ("MAP") cases within an average timeframe of 24 months. To monitor compliance with this, members of the Inclusive Framework on BEPS have committed to report their MAP statistics pursuant to an agreed reporting framework. Such reporting provides a tangible measure of the effects of the collective implementation of some elements of the Action 14 minimum standard and now includes data from over 65 jurisdictions. These MAP statistics are now available for the 2016 reporting period. ‌‌In comparison with the 2015 MAP statistics, both the number of MAP cases in start inventory and the number of started MAP cases have increased, which results from both an increase in the number of reporting jurisdictions and modified counting rules. Approximately 8,000 cases were in the inventory of the reporting jurisdictions as of 1 January 2016 and almost 25% of them were closed during 2016. 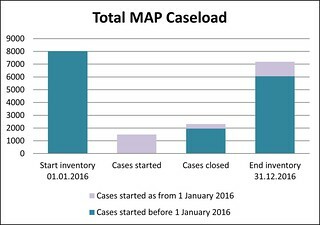 Almost 1,500 cases started on or after 1 January 2016, and approximately 25% of them were already closed in 2016. Transfer pricing cases account for slightly more than half of the MAP cases in inventory. Transfer pricing cases take more time on average than other cases: approximately 30 months are needed for transfer pricing cases and 17 months for other cases. Over 85% of MAPs concluded in 2016 resolved the issue. Almost 60% of MAP cases closed were resolved with an agreement fully resolving the taxation not in accordance with the tax treaty and almost 20% of them were granted a unilateral relief while almost 5% were resolved via domestic remedy. Finally, 5% of the MAP cases closed were withdrawn by taxpayers while approximately 10% were not resolved for various reasons. The agreed reporting framework reflects a collaborative approach for cases started as from 1 January 2016, which is the date as from when the reporting jurisdictions committed to implement the Action 14 minimum standard. The agreed reporting framework provides common definitions (MAP case, start date, end date, outcomes), which are now used for counting MAP cases and computing the average time needed to close MAP cases. Each jurisdiction reports MAP statistics per treaty partner or per category of treaty partners and each case initiated as from 1 January 2016 in a given jurisdiction now appears in the MAP statistics of the treaty partner that is involved as well, which enables to identify the cases that are reported by two different jurisdictions at the same time and avoids double counting of these cases. The MAP statistics also show the types of cases concerned (transfer pricing or other cases) and the outcomes reached, classified in ten categories. For more information on the MAP statistics, please visit www.oecd.org/tax/dispute/mutual-agreement-procedure-statistics.htm or contact Pascal Saint-Amans, Director of the OECD Centre for Tax Policy and Administration (+33 6 26 30 49 23) or Achim Pross, Head of the International Co-operation and Tax Administration Division (+33 1 45 24 98 92).